Those of you with long memories and a compulsive TV viewing habit might remember [Max Headroom], a quirky piece of TV ephemera from the late 1980s and early 1990s. [Max] was a supposedly computer generated TV show host and VJ with a pseudomechanical stutter, a slightly blocky rendered head, and a moving background of rendered lines. He looks a little quaint for viewers with a few decades viewing experience of CGI, but in his day he was cutting-edge cypberpunk TV. He also made unscheduled showings on two Chicago TV stations in an audacious hack that has never been explained and whose culprit has never been found. 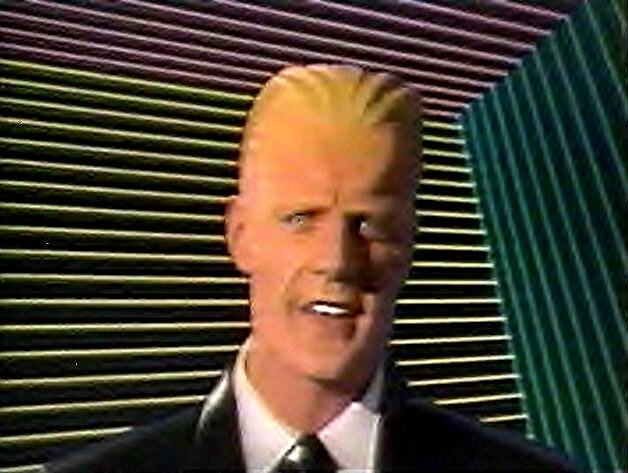 The real [Max Headroom] (Fair use) Via Wikimedia Commons. If you were a bored British teenager and future Hackaday writer vegging out in front of your parents’ TV on an April night in 1985, you’d have caught [Max]’s genesis. He strung upon us by rising out of a title screen full of static in the Channel 4 TV movie [Max Headroom]: 20 Minutes into the Future. The plot is a trip in itself. An investigative journalist seeking to uncover the sinister owners of his network (they run speeded-up adverts with the unfortunate side-effect of causing overweight viewers to explode) is pursued, causing a road accident in which he is injured by a collision with a safety barrier. Hence the name: [Max Headroom]. The network try to cover it up by producing a computerized facsimilie of the reporter which turns out to be an embarassing failure. They scrap the computer and it falls into the hands of a pirate TV station operating from a decrepit campervan, the Alphabetti-eating proprietor of which turns the character it contains into a TV sensation. Meanwhile the reporter escapes, recovers, and prevails over the villains. The [Max] character proved to be something of a hit, with a TV spin-off series, VJing, adverts, and more. But that wasn’t the whole story of his appearances, back to that unexplained hack of Chicagoland TV. 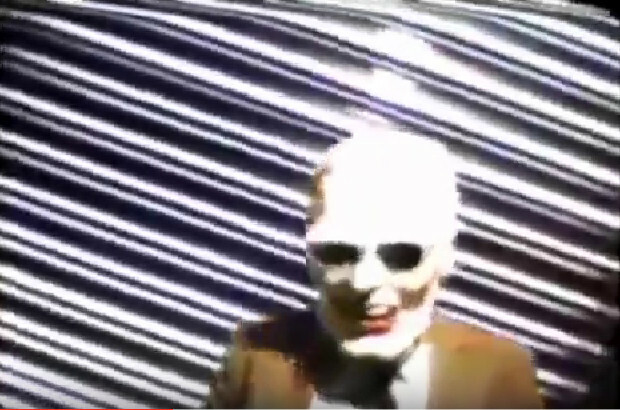 The Chicago fake [Max Headroom]. On the night of the 22nd of November 1987, viewers of WGN were watching a sports program when the screen went blank and they were treated to a few seconds of a slightly home-made [Max Headroom] dancing in front of those trademark moving lines. A couple of hours later on WTTW a rerun of a [Doctor Who] episode was again interrupted with the same fake [Max], this time speaking for a while before, if his performance wasn’t already bizarre enough, being spanked by a woman whose face is off camera. As a piece of television history it’s an intriguing mystery, though since so little is known about the mechanism through which it was achieved it hasn’t achieved the notoriety in the technical world that you might expect. The stations involved conducted full investigations at the time and failed to locate a culprit, perhaps they should have been looking for that old campervan with the antennae on its roof. It is very unlikely that a similar stunt could be performed today, with entirely digital TV studios and easy access to encryption technologies for external links to transmitter sites. But in the 1980s a studio would still have been an analogue affair so there would have been more opportunities to insert an unauthorized feed. Next year sees the 30th anniversary of the event, it would be fascinating if the perpetrator would mark it by anonymously revealing how it was achieved. Of course, we’d love to hear how you would have done it in the comments below. Surely we have readers who are intimately familiar with the television broadcasting equipment of the time. Below the break we’re showing you both fake [Max] intrusions into the Chicago airwaves. First is the short outing on EGN, below that the longer one on WTTV.